Init, lamig, ulan? Who can tell? Make sure you’re protected! 1. Always check the weather report. Before leaving the house, check the news for possible rain showers so you can prepare accordingly. 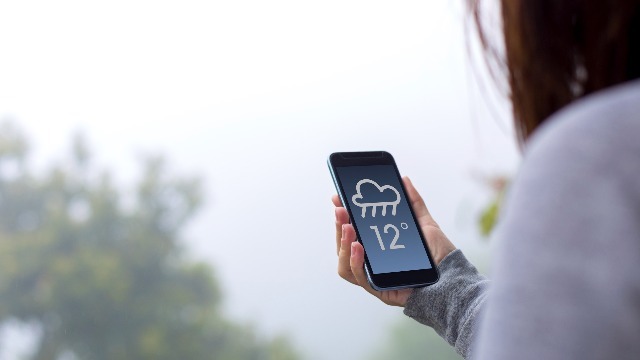 Better yet, download apps like AccuWeather and Weather Underground so you can check the weather in real time. 2. Bring an umbrella with you wherever you go. Rain or shine, you’re going to want to have one over your head! 3. Or one of those portable fans. If it gets too hot, you’ll at least have a bit of air to cool you down! A bomber jacket or a cardigan doesn’t just make you look more stylish: it also makes it easier for you to stay cool or warm throughout the day. 5. And learn to accessorize. You never know when that cap or those sunglasses will come in handy! It’s usually around this time when people start getting sick—not necessarily because of the changes in weather, but because of the changes in their routines. Take measures to protect yourself before you get downed by a nasty bug! On the other hand, drastic weather changes can lead to migraines. Avoid this by drinking more liquids—and no, coffee doesn’t count. 8. Keep a change of clothes in the office. That way, no one will have to know the kind of hell you had to go through today. Trust us, you do not want to be stuck in traffic beside a smoke-belching bus when the sun is at its brightest, nor would you want to be stuck in a flooded street when the rain’s coming down hard. Whether you’re dodging puddles on your way home or waiting in line under the heat of the sun, you’re bound to get a little sweaty. Make sure you don’t end up with body odor by using a deodorant that can get you through the day! While all antiperspirants can ward off germs that live in the underarm area, not all of them can protect you against the many types of odor-causing bacteria out there. #FightBac with Rexona's newest variant, Rexona Antibacterial Defense! Its Motionsense Technology keeps you fresh every time you move, while citrus oils and Aluminum Chlorohydrate kill odor-causing germs efficiently. This results in an antibacterial formulation that specifically targets and eliminates odor-causing bacteria 10 times better than ordinary soap does, keeping you fresh, dry and protected for up to 48 hours. Try it now! Like Rexona on Facebook for more information.